Dr. Sylvester Andral Kilmer, M.D., had been heralded as a leading physician of our country, and devoted his 60-year practice to the study of diseases and their treatments. His impressive medical training was at some of the most respected medical schools, and he also studied under a pioneer of homeopathy, making him one of the earliest practitioners of integrative medicine. According to biographers, Dr. Kilmer found that the ailments that afflict people in our modern age — digestive problems, obesity, water retention, kidney disease, bladder problems, bowel irregularity and liver problems — are the result of hidden chemical additives in modern methods of food processing and preserving, that strain the body. He developed medicines that promised to not only relieve, cure and restore all of these important organs to health, but also strengthen and stimulate them so that they would function optimally to process nutrition, cleanse the blood and rid the body of chemical and biological waste. I say “is” because Swamp Root is still sold today, more than 120 years after it was first produced. Its distributor says it is “an approved medicine of the FDA and has received countless testimonials as to its effective benefit.” The Kilmer family business was well reputed and made many different medicines, including Ocean Weed Heart Remedy, Female Remedy, Indian Cough and Consumption Cure and Prompt Parilla Pills. 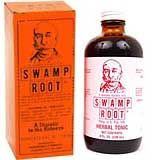 Swamp Root, alone, made the family about a million dollars a year, according to Willis Sharpe Kilmer, Dr. Kilmer’s brother who graduated from Cornell University in 1880 and took over the business. When he died in 1940, his estate was estimated to be worth $10-15 million dollars. Dr. Kilmer’s Guide to Health cautioned readers to “beware of fraud and imposters.” But, of course, it was these early patent medicines, which made extravagant claims to be able to cure just about everything and often targeted women and children, that epitomized the Latin phrase: caveat emptor — buyer beware. Patent medicines came to be known as snake oil medicines — named after one that claimed to actually contain snake oil — and synonymous with quackery. By the middle 19th century, patent medicines were a major industry in the United States, according to Hagley Museum and Library in Wilmington, Delaware. The patent medicine industry also pioneered many of today’s advertising and marketing techniques, according to the Smithsonian National Museum of American History. Consequently, slick snake oil salesmen, are also today’s popular term for charlatans. But, as recognition of the importance of medical science grew, some doctors argued for legitimate treatments and against quackery and fraudulent advertising. Not surprisingly, they were met with fierce resistance from the manufacturers and their trade association, but also much of mainstream media, which had become dependent on the advertising revenue they received. Finally, in an historic series by Samuel Hopkins Adams in Collier’s magazine in 1905-1906, some of the fraudulent and dangerous methods practiced by patent medicine makers were exposed. Eventually the science and increasing disclosures of the quackery reached the public, resulting in the passage of the Pure Food and Drug Act of 1906 and the Food, Drug and Cosmetic Act of 1938, which curbed the most fraudulent label claims. It resulted in the demise of most of these early 17th – 19th century patent medicines. A few of these early patent medicines are still around, although most have considerably toned down their claims. Certainly, nothing like the pervasiveness of patent medicines of the mid-nineteenth century could ever happen again... could it? Who’s driving the growth of dietary supplements today, as well as preventive health programs promising optimal wellness and anti-aging benefits? It’s the last place most consumers would expect. The biggest source of growth is conventionally trained doctors, nurses and massage therapists. Supplements, alone, being sold by practitioners from their offices and websites, are growing 7.5% a year, topping $1.7 billion in 2006 and anticipated to exceed $2.5 billion this year, according to the Nutrition Business Journal’s 2007 report, “Complementary & Alternative Medicine and Practitioner Supplement Sales.” Mainstream doctors now account for nearly 20% of all supplement sales. With so many doctors adding anti-aging and lifestyle medicine to their practices and promoting antioxidants and other supplements, does that mean consumers can trust it all to be safe and proven? [But] something new is happening in the world of anti-aging. Mainstream doctors who once wanted nothing to do with the naturopaths, osteopaths and others who first populated modern anti-aging, and whom they often considered glorified carnival barkers, are buying in, signing up for “certification” as anti-aging practitioners and offering patients the promise of youth and rejuvenation through such treatments as human growth hormone, testosterone, special diet and exercise regimens, antioxidants and hundreds of other supplements. “It is mushrooming,” says Dr. Elliot Snyder, an emergency room physician based in Northern California who follows the movement closely by frequently attending anti-aging meetings and talking to friends in the field. He also uses some of its techniques himself. Besides exercising five days a week and following a strict low-fat diet that includes lots of fruits, vegetables and wild salmon but no white flour or red meat, he takes supplements ... about 50 pills per day. The latest A4M conference, held this past December, was attended by some 2,000 business owners, anti-aging promoters and hundreds of doctors. The co-founder of the organization, Dr. Robert Goldman, says there are now 20,000 doctors who they’ve certified in anti-aging medicine. Alexander’s investigation found that A4M’s U.S. revenue from certification fees alone totaled $1.2 million in 2006. An article this past December in My Long Life.com, profiled the president of A4M, Dr. Ronald Klatz, and its chairman of the board, Dr. Robert Goldman. They are bringing anti-aging medicine to medical professionals around the world, speaking at two recent events backed by the Chinese government, China Pharmaceutical Association and China Medical Association among other Chinese medical organizations: the World Anti-Aging Congress and China Pharma Exposition, and the China Health Industry Forum. “Chinese investors expect in next five years to build over 10,000 anti-aging hospitals, elite medical spas, Olympic-level sports medicine facilities, and anti-aging out-patient health check clinics,” the article revealed. A4M not only offers board certification for the medical specialty of Anti-Aging & Regenerative Medicine, it already oversees ongoing training of 60,000 doctors and surgeons on-site, and 500,000 healthcare professionals around the world through its international programs. A4M also accreditates anti-aging medical centers, hospital and medical spas through its new World Council on Clinical Accreditation. “China's over one billion consumers could well further accelerate this growth and become the new global powerhouse of anti-aging medicine,” it said. A4M isn’t the only anti-aging medical association. A rival organization, Age Management Medicine Group, had more than 400 doctors at its last meeting. That meeting had been sponsored by the country’s largest healthy aging and longevity company, Cenegenics, which also certifies practitioners in “age-management medicine.” Its program for healthcare provider affiliates offers health assessments ($2,500) and anti-aging vitamin and supplement regimens ($300-$00/month) that includes growth hormones and low-glycemic diets. It is marketed to doctors as a way for them to secure their economic futures. According to its co-founder Rick Merner, it has more than 800 doctor affiliates. Since 1997, our world-class physicians have shifted medicine’s focus from disease to health. Their innovative, proactive approach helps Cenegenics’ patients stay healthy, vital, vigorous, mentally sharp and sexually active their entire lives. Cenegenics is the genesis of medicine’s next generation… well-proven, evidence-based medical science... 25% of our patients are doctors and their families. Cenegenics encourages you to live well longer... Bio-Identical Hormone Replacement is a foundation of Anti-Aging Medicine by Cenegenics and includes HGH or human growth hormone, testosterone and DHEA therapy for deficient adults... Cenegenics total health optimization is achieved through the synergy of the five Age Management Medicine or Anti Aging Medicine program elements including bio-identical hormone replacement, science based nutraceutical supplementation, low glycemic index diet, exercise and stress reduction. Corporate Wellness Partners is another Cenegenics affiliate. It also offers a comprehensive health risk evaluation, this one sold to corporations for their employees and executives, that says it determines their real age, and provides a personal wellness plan with targeted diet and nutrition program and ongoing preventive health management said to slow or even reverse the aging process. It promises corporations its program will help contain their healthcare costs. Long Life Sciences in Los Gatos, California, another Cenegenic’s affiliate, includes chiropractics and “neurofeedback therapy” for children and adults with ADHD; vitamins, herbs and nutraceutical; and hyperbaric oxygen that is said to not only enhance memory and physical performance, but proven beneficial for autism, asthma, allergies, brain injury, stroke, cerebral palsy, chronic fatigue and lyme disease. According to Dr. Arnold Relman, professor emeritus of medicine and social medicine at Harvard Medical School, “the interest in anti-aging practice is mainly based on economic considerations” by physicians who are looking to boost income. These financial incentives are clearly evident among the anti-aging promotions to doctors. These days, many anti-aging promoters, seeking to shed the flim-flam image, are ratcheting down the rhetoric. They have begun using terms like “age management” and “healthy aging” that imply realistic goals and give important, if commonsense, advice. Most anti-aging doctors tell patients what we already know: Exercise. Lose weight. Lower our blood pressure. Don’t smoke. “I do not see this as the basis for a new practice specialty,” argues Relman. While mainstream medicine may look askance at anti-aging, major healthcare centers have adopted these alternative modalities as part of integrative health programs and some of the most renowned clinics in the country offer executive health programs with health risk assessments that charge thousands of dollars for a day, said Alexander. The Bravewell Collaborative, a philanthropy founded by Christy and John Mack of Morgan Stanley and Penny and Bill George of Medtronic, has funded clinical research, as well as health systems development at integrative medical centers across the nation. Continuing medical education programs on nutrition and other aspects of natural medicine are blossoming. The growth of groups such as the Institute of Functional Medicine, American College for Advancement in Medicine ... the American Board of Holistic Medicine and the American Clinical Board of Nutrition, offering doctors formal certification in holistic disciplines. In an historic first, the American Holistic Medical Association and the American Association of Naturopathic Physicians are holding a joint annual meeting. Even the conservative American Academy of Family Physicians, she said, is becoming more positively receptive to nutraceuticals and functional medicine. Many primary care doctors are fighting to survive, seeing their insurance reimbursements and incomes falling, and workloads and administrative paperwork increasing. The number of doctors taking bank loans to keep their practices afloat has hit an all-time high, as has the number of doctors defaulting, according to Dr. Keenan. So, leading nutraceutical channel and functional diagnostic testing fields are responding with “comprehensive turn-key programs designed to make it easier for physicians to incorporate nutrition-based medicine into their practices,” she said. Since 2005, Georgetown has also offered a masters of alternative medicine. This curriculum includes herbal medicine, nutritional supplements, homeopathy, acupuncture, naturopathy, mind-body techniques, and manipulative techniques. Dr. Keenan is also chairing the first conference, “Heal Thy Practice: Transforming Primary Care,” for this fall (at $895 a head). Its programs will present business development and practice strategies for doctors looking to add alternative modalities into their practices. This conference is being given by Holistic Primary Care News, a 4-year old company that publishes “scientifically sound information on natural medicine and holistic healthcare,” said to reach 100,000 doctors nationwide. Its editorial and design team also offers to create science-based monographs, continuing education modules, and other marketing collateral for advertisers to help build their brand, while educating and informing their target market about the benefits of their products. Another sponsor is Sedona Labs which supplies probiotics, enzymes and colostrum specifically to healthcare providers. [S]omething is clearly shifting in the attitudes of mainstream family physicians. Whether it is simply a reflection of their economic desperation, a desire to please their alternative-minded patients, or a genuine interest in what natural medicine has to offer, I believe it is a very positive and encouraging signal for the nutraceuticals industry. The public trusts that today’s promotion of preventive health and wellness programs, nutraceuticals, and ‘healthy’ dietary interventions to help them attain optimal wellness and live longer that are coming from mainstream medical professionals and reputable clinics is sound. When those trusts are broken by modalities that are unsupported by scientific evidence, it can be helpful to look at possible conflicts of interests or try to understand the reasons for the disconnect. History teaches us the importance of caveat emptor. Do doctors and nurses, increasingly trained in “other ways of knowing,” really believe in these supplements and anti-aging modalities, or do they understand the scientific process and know what they’re selling, but do it anyway? Neither answer is very reassuring.